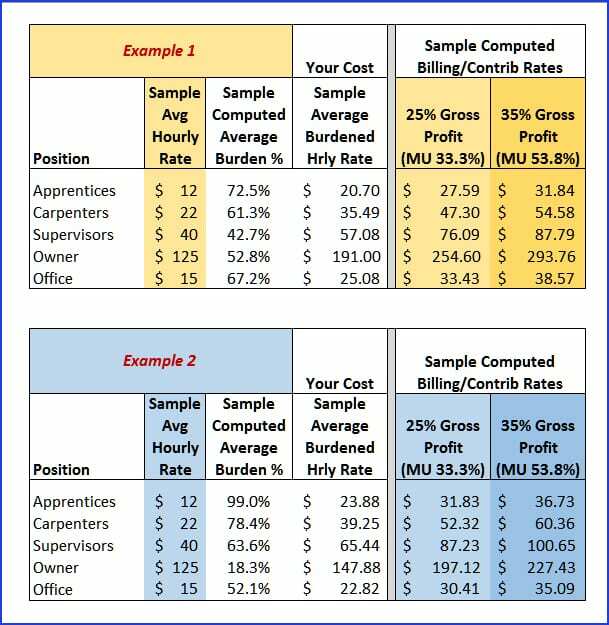 Use your employee Cost & Pricing Analyzer™ (eCPA) to determine your true (fully-burdened) cost of labor for each classification of employee. You will discover what you need to charge (or earn) per hour for employee time. You can then create an estimate, quote, or bid which will not only cover your true employee costs – but will create the profit that you deserve to earn from each job. To help illustrate, I’ll create a scenario in which a client has two different companies (Gold and Blue). One of the companies handles kitchens, baths, and additions. 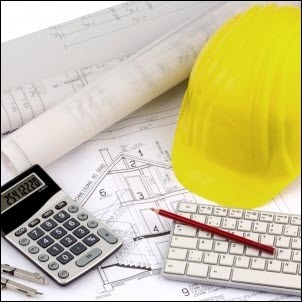 The other company focuses on remodels and restorations. They’d like to see what billing (earning) rates for labor would look like for each company for both 25% and 35% gross profit margins. To begin to analyze the results, we decided to start by focusing on just a single position: Carpenters. Because Carpenters in the Gold Company have a burden percentage of 61.3%, their cost to the company comes to $35.49 per hour. Carpenters in the Blue Company have a higher burden rate of 78.4% so their cost to the company comes to $39.25 ($3.76 per hour difference). Doesn’t sound like a huge amount, right? But see what happens when we convert these differences into hourly and annual billing rates. To achieve a 25% gross profit margin on labor, the Gold Company will bill out their Carpenters for $47.30 per hour. To hit a 35% gross profit margin, the hourly billing rate would be $54.58: $7.28 more per hour (15.4% above the 25% gross profit target). Now that they see their fully burdened numbers and marked up results, the Gold Company will be able to set their billing rates so they can hit their profit targets on Carpenter labor. They will need to charge $52.32 per hour to achieve a 25% gross profit, ($5.02 more per hour than the Gold Company). To make a 35% gross profit they will need to bill out Carpenters at $60.36 per hour ($5.78 more per hour than the Gold Company). With this information, the Blue Company also be able to decide what they should be charging for their Carpenters’ time. For 25% Gross Profit Margin: 1,850 hours x $5.02 = $9,287 PER CARPENTER. If they have 3 Carpenters, they’ll need to bill out $27,861 more per year than the Gold Company. For 35% Gross Profit Margin: 1850 hours x $5.78 = $10,693 PER CARPENTER. If they have 3 Carpenters, they’ll need to bill out $32,079 more per year than the Gold Company. By walking through the numbers – one step at a time – we can see that the driving force behind establishing profitable pricing – for each company – starts with knowing their employees’ fully-burdened hourly labor costs. Note: Many people who have performed these calculations find that they need to adjust their pricing. In some cases they need to increase rates, and in others, they find that they can reduce their prices to be more competitive. Are you confident in your current pricing? Or could your numbers use a “look-through”? Click here to access a free (single employee) Cost & Pricing Analyzer™ (eCPA). This is one of a series of useful tips that show how you can add to your bottom line when you know each employee’s true hourly cost! Disclaimer: All numbers presented herein are theoretical and should not be construed as industry averages. You will need to use your own eCPA to see your own company’s true, fully burdened costs. Lots of bio info available about Diane: Select the "More" tab, then "Diane Gilson".